Excited rafters plunge into a rapid on New River. Photo courtesy River Expeditions. 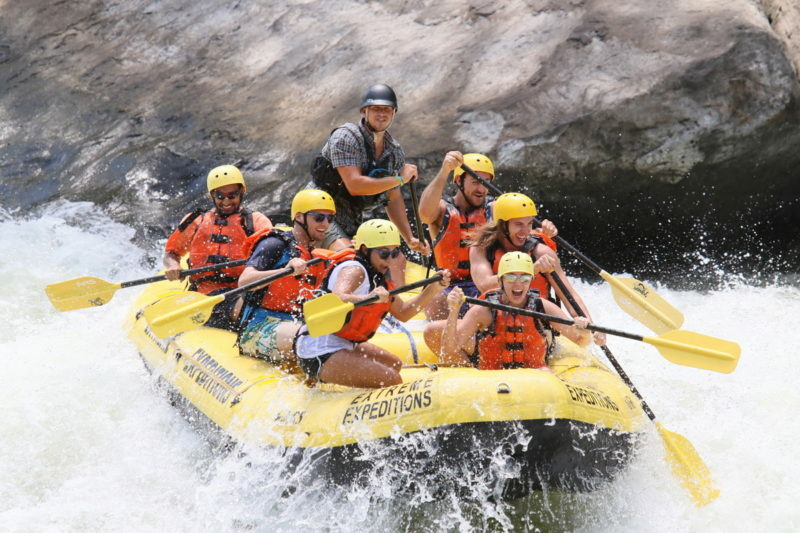 River Expeditions will celebrate the 50th anniversary of whitewater rafting in West Virginia June 20 with discounted trips on the New River, according to its vice president. The industry that helped popularize the Mountain State as an outdoor-recreation destination hasn’t existed that long, says Heather Johnson, and the anniversary of its first whitewater rafting trip is cause for celebration. “Though West Virginia may seem synonymous with rafting, the first raft challenged the rapids of the New River only 50 years ago,” Johnson said. On June 20 — West Virginia Day — River Expeditions will observe the milestone occasion by offering its Express New River Gorge Rafting Trip for only $50 — with morning and afternoon departures available, Johnson said. Rafters who take part in the offer are welcome to enjoy all the amenities River Expeditions offers at its 100-acre resort, which includes zipline tours, rock climbing, mountain biking, and a paintball field. And overnight guests have access to the Fire Creek Lodge with complimentary Wi-Fi, complimentary breakfast, and exclusive use of its outdoor pool and hot tub. Drink specials will also be made available to participants afterward at the Red Dog River Saloon & Grill. A fourth consecutive night’s lodging spent at the resort is free, Johnson said. Located near Fayetteville, the resort also includes a dining hall, outfitters shop, and meeting facilities as well as the lodge, saloon, and grill, and guests are welcome to stay in their choice of campgrounds as well as dozens of rustic and deluxe cabins. For more information on rafting packages for general information about River Expeditions, call 800-463-9873 or visit their website.